We are all thinking about #Canada150 here! 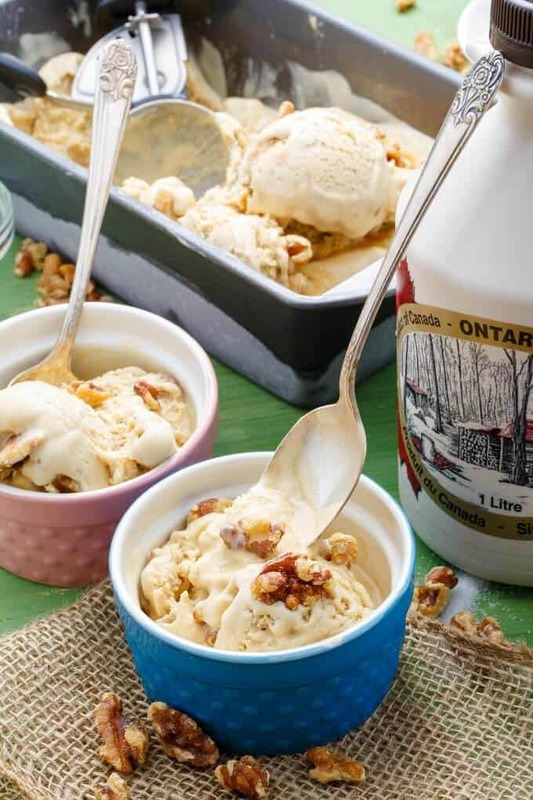 Maple syrup is probably one of the top 3 foods/ingredients that comes to mind when thinking of Canadian cuisine so of course I had to make some wonderful homemade maple walnut ice cream using fresh Canadian syrup! Hot temperatures are here, school is done in less than three weeks, and Canada celebrates 150 years this July 1st! With all these happenings, I figured ice cream was in order. 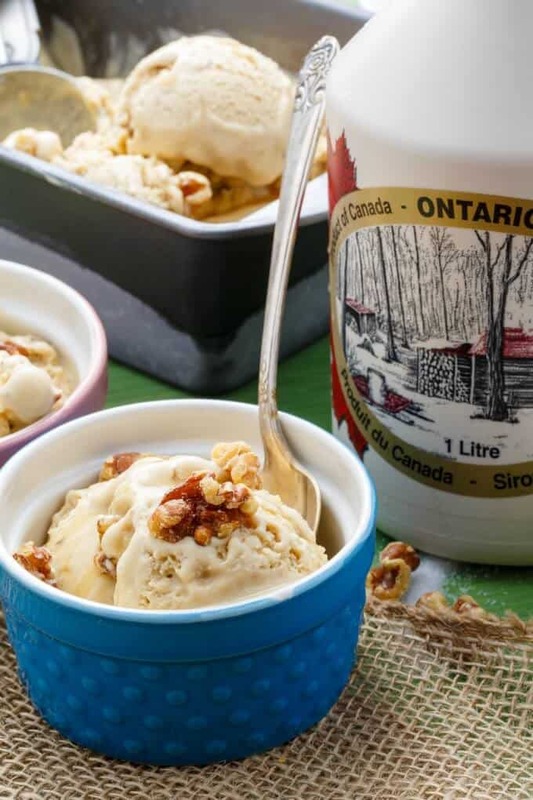 Before we go breaking out that Kraft Dinner, Ketchup Chips, and Tourtière, let’s really talk about how delicious and creamy this maple walnut ice cream is! 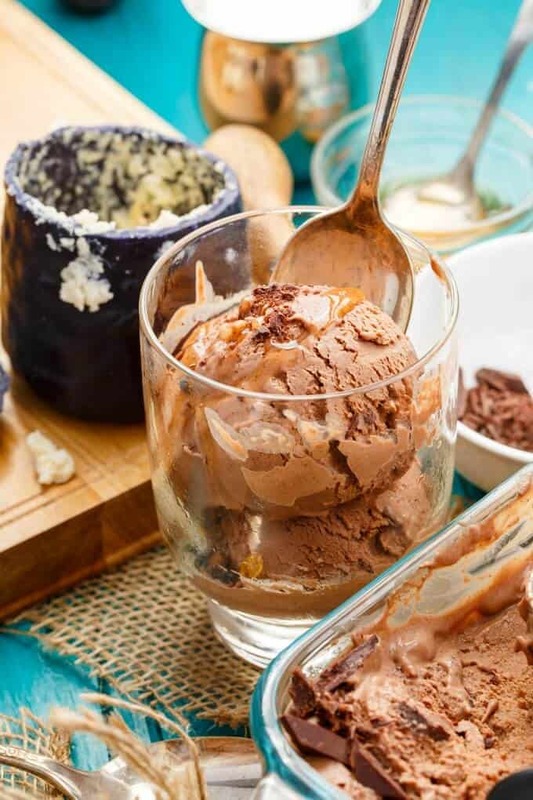 Without getting political or heavily nutritional-based, I’ll just focus on why I love real ice cream so much! 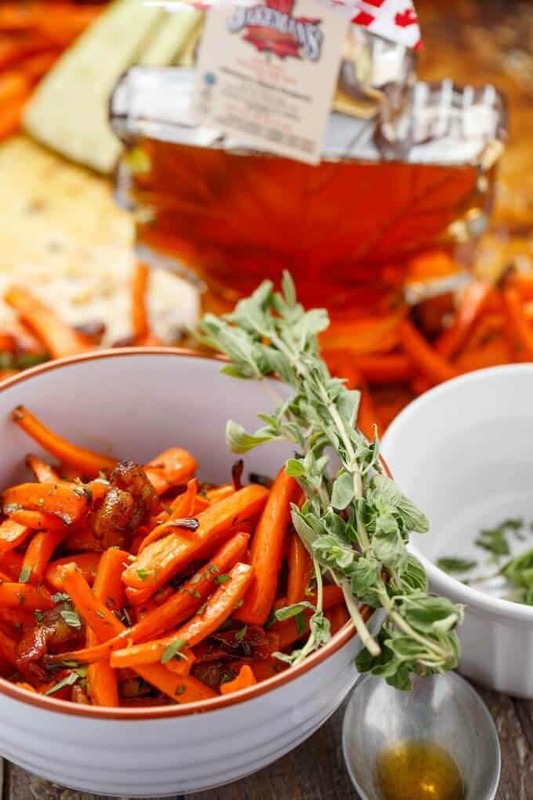 Reducing the maple syrup brings out a more concentrated flavour palette! Preheat oven to 350F. Place walnuts on baking sheet and cook for 10 minutes, tossing every so often, until lightly browned. Roughly chop. Add egg yolks to a large mixing bowl. Whisk until paler in colour. Set aside. Place a medium-sized saucepan over medium heat. Add syrup and bring to a boil. Reduce heat and simmer until reduced to 3/4 cup (you can even go crazier and reduce the syrup to half cup!) Stir in 1 cup cream, milk, and salt. Raise heat to medium and whisk occasionally until mixture is hot but not boiling. Slowly and carefully whisk cream-mixture into yolks, making sure to take your time so you don't scramble the eggs. Whisk until smooth. *Pour through fine sieve if needed. Return mixture back to stove top. Combine remaining cream and cornstarch and pour into pan. Whisk occasionally until reheated, but do not allow to boil. Remove from heat and allow to come to room temperature (stirring occasionally.) Cover and refrigerate overnight. Follow the directions on your ice cream machine. I churn my mixture until it is almost set, and stir in the chopped walnuts in the last 5 minutes of the cycle. 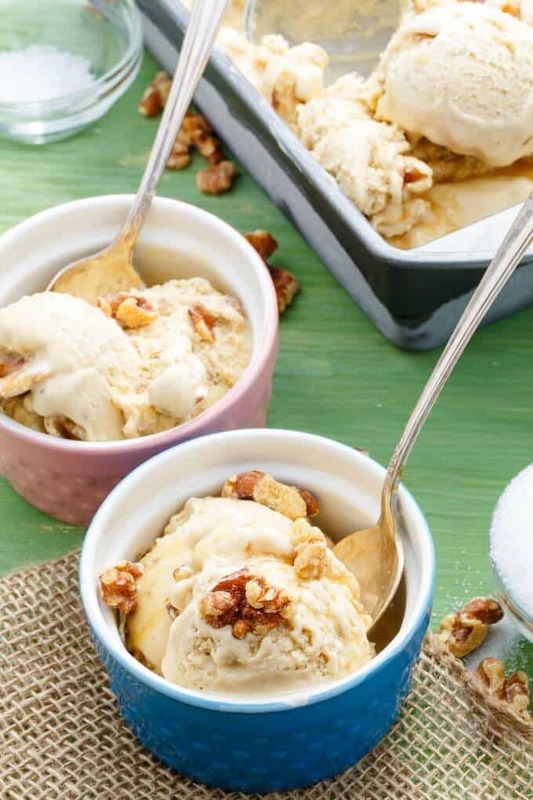 Pour into container, top with additional walnuts and maple syrup if desired, and freeze! I’ve been talking about Canada 150 so much that I seemed to have skipped over the fact that Father’s Day is this weekend! I know both my husband and dad would love this! 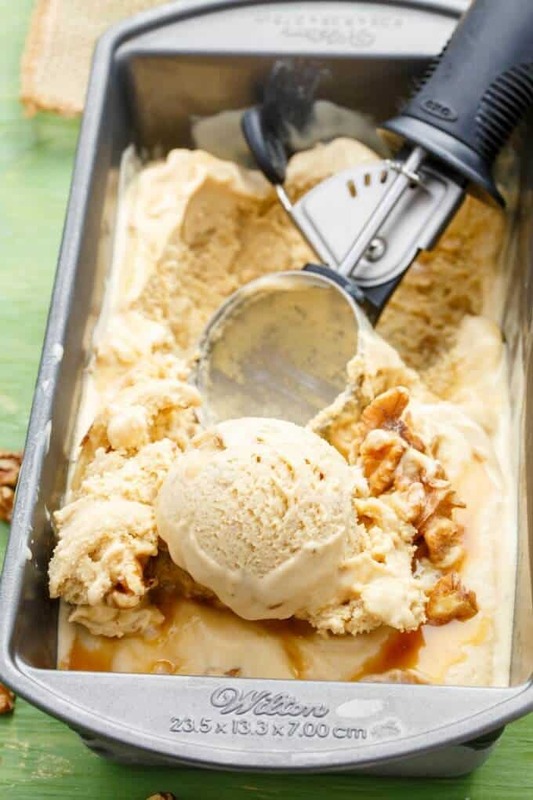 We joke maple walnut ice cream is an old person’s flavour choice, but let’s be honest, it is a flavour that very few do not enjoy!